There are probably three distinct types of Siamese cats, although some cat fanciers acknowledge only two. It's important to know that 'type', as used by breeders, refers to a cat's body shape, not its color. So each of the three types outlined here can also be found in every one of the Siamese cat colors. Sorting out the distinctions between the different kinds of Siamese cats can be a little complicated, but our descriptions below will help you to identify the main Siamese cat types. Pictures of the first cats of this breed to reach the western world show that they were bigger and heavier than many of them are today. They had wider necks, and rounder bodies and faces than the slight-bodied types you're likely to see in a lot of shows these days. So just when and why did the look change? For quite some time, breed standard guidelines for show judges have called for Siamese cats to have long slim bodies, long slim legs and tails, long necks, triangular-shaped heads and large ears. Because of this, selective breeding over the years has altered the body type, taking it away from the look of those original Thai cats towards a longer, leaner, more angular shape by favoring and breeding from cats that accentuated these characteristics. 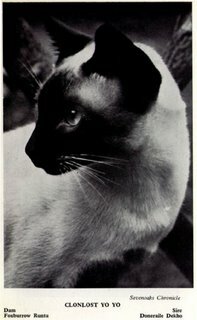 Of course there are many Siamese cat characteristics common to all, and until the 1980s, when attempts were made to classify the different types of Siamese cats, there was really no distinction made in 'type' despite there being a number of different body shapes. No two cats are identical, and it can sometimes be difficult to look at an individual cat and say with certainty that it's one type or another. There are many variations in body shape, and they all fall somewhere along a wide spectrum of shapes and sizes. So the descriptions that follow are a quick reference guide to the three most usually accepted types of Siamese cats, and link to individual pages and pictures of each of the different types. The types of cats first exported from Siam (now Thailand) seen in the picture above, had round faces and rounded, muscular, heavy bodies. Over the years the trend away from this body type towards a leaner, more angular cat unfortunately led to some serious health problems (probably through in-breeding) and this in turn led to a move by some breeders to try and re-create the look and health of these original cats. This led to the development of 'applehead' Siamese cats, a type produced through cross-breeding with, in particular, the American and British Shorthair breeds, to produce a cat with a rounder, shorter face and stockier body. Falling somewhere between the applehead and today's modern Siamese, there's a further body type referred to variously as moderate, classic, Thai, or old-style - referring to the look of cats that were popular in the '50s, '60s, and '70s. They are also sometimes referred to as old-fashioned Siamese cats for this reason. Distinctions are sometimes blurred between the applehead and these old-fashioned Siamese. However, while still quite large-boned, the latter generally have longer, slimmer bodies than appleheads. They also have finer, more triangular faces, although nowhere near as extreme as those found in the modern Siamese. 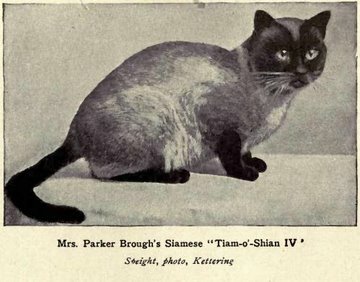 The Old Style Siamese Club in the UK, and the Prestwick-Beresford Old-Style Siamese Breed Preservation Society (PREOSSIA) in the United States, work to promote and encourage the breeding of these beautiful and healthy cats. The type of Siamese cats found in many show rings today are known as modern Siamese or 'show-style'. They're the easiest of all to identify, having the most extreme body shape. Show-style cats are slight, fine-boned, and long and thin all over, with long thin bodies, necks and tails and sharply triangular heads with large ears. They also have longer muzzles and a straighter nose than the two previous types of Siamese cats. Cats of this type are very elegant, but breeding towards this body shape led to some quite serious health problems in the past. The trend towards smaller heads and larger ears resulted in some cases in visible birth defects, with kittens even being born with eyes on the sides of their heads. There were also cases of organ damage including cardiomyopathy and kidney failure, shortening the lives of many examples of this type of cat. This doesn't happen in all cases, though, and healthy modern Siamese may live just as long as either of the other types. Applehead, old-fashioned or modern, the different types of Siamese cats are all beautiful and there's certainly no best or worst. It's all a matter of individual preference. 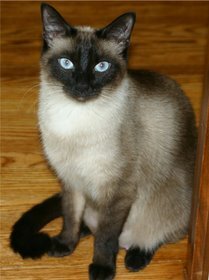 My particular favorite is the old-fashioned Siamese because this is the type of cat that I grew up with. We Are Siamese - films, novels, cartoons and poems! Click the links below and see which types of cat some of our other visitors have.